Hostapd-wpe (Wireless Pwnage Edition) is a patch for hostapd v2.2 created by the OpenSecurity Research group aiming to replace FreeRadius-WPE. The WPE patch implements 802.1X authentication server impersonation attacks in order to obtain client credentials, but also implements Cupid attack, allowing to exploit heartbleed vulnerability (CVE-2014-0160) on client connections over EAP-PEAP/TLS/TTLS. 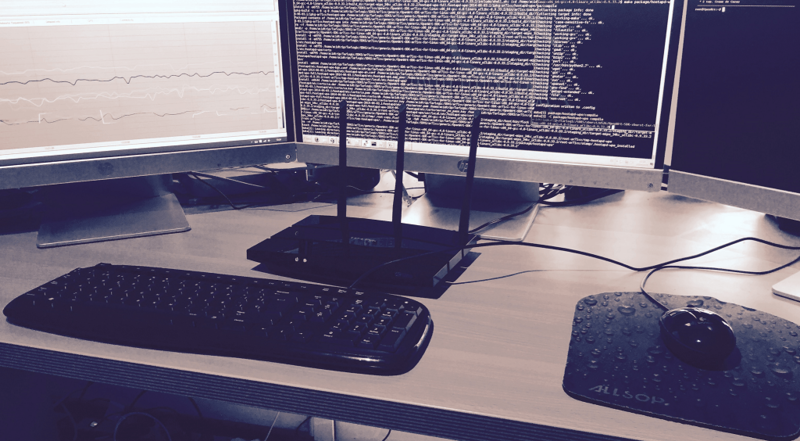 This article arises after the need for a portable device for testing wireless infrastructures security (802.11b/g/n and 802.11ac) . To do this it was decided to purchase a router TP-Link Archer C5 AC1200 (supported by OpenWrt) and a rechargeable Portable Charger Powergorilla to give autonomy to the device. OpenWrt already has a package that includes the Aircrack-ng suite tools, but has no default package for testing WPA-Enterprise environments. The Tarlogic Security team (Acrylic WiFi) has created a hostapd-wpe custom package for OpenWrt Barrier Breaker. The original wpe patch was designed to perform source code modifications on hostapd v2.2, but the hostapd package for OpenWrt has many patches that modify the source code base in order to fix different errors, consequently it was necessary to apply the WPE patch changes manually. OPKG (.ipk) packages have been created for all architectures supported by OpenWrt. Functional configuration files have also been included allowing to set up an 802.11bgn or 802.11ac networks. The package for TP-Link Archer C5 AC1200 is located at ipk/ar71xx/generic. The cross-compiling procedure to create the hostapd-WPE package for any specific architecture supported by OpenWrt is detailed below. The SDK tools require the following modules: GNU C++, GNU AWK, ncurses, zlib, ccache, Git, Mercurial/Hg and subversion. The following comamnd can be used to download the modules. Select the firmware release Barrier Breaker 14.07. Select subtarget. For TP-Link Archer C5 is generic. bootstrap: Script for custom self signed certificates creation. certs: Default certificates and private keys. Finally move to the SDK root folder and execute the make package command. rom this point the package can be installed manually. In order to install hostapd-wpe, the created ipk for the target architecture will need to be copied to the device using SCP. To install the package you should use the following command. The hostapd-wpe binary will be deployed in /usr/sbin and the configuration files will be copied into /usr/local/etc/hostapd-wpe. The following article will detail how to use hostapd-wpe to crack client hashes in order to recover client credentials in WPA Enterprise (802.1X) environments. F.Y.I. I have opened a ticket in sensepost/mana in order to aggregate all efforts to port it on OpenWRT in one place. Hi Luca! Thanks for your contribution.